Book Challenge Day 1-Favorite Book/Author | What are we...the Whos? What is your favorite book and author of all time? I had purchased this book in a used book store several years ago and just never got around to reading it. I had so many recommendations from family and friends that Running With Scissors simply kept getting pushed back. But I finally grabbed it off my bookshelf earlier this year and was immediately sucked in. He was able to take what can only be described as a horrifically disturbing childhood and tell it in a way that overwhelms you with disgust, but can still make you laugh out loud. Okay so this is one great book, but why is Augusten Burroughs my all-time favorite author? Well, he is truly the most gifted writer I have ever encountered. The second I finished Running With Scissors, I purchased all of his other books and they were all fantastic in different ways. His short stories (something I’ve never been able to get in to) were simply remarkable. He doesn’t tell you what he’s feeling, he doesn’t even just show you what he’s feeling, he makes you feel it. His writing is the inspiration I didn’t know I was looking for. I have always wanted to write, but never felt that my writing could actually go anywhere, or that it was worth reading by other people. But, once I read his stuff, I just knew that writing is what I should be doing. Regardless of whether or not people read it, it makes me happy and I should at least try. So I started this blog, and though I check the site stats more than I care to admit, I keep writing no matter what they look like. Maybe one of these days you’ll all be reading my first novel. And, if you do, know that the reason I finally started it lies with Augusten Burroughs and Running With Scissors. 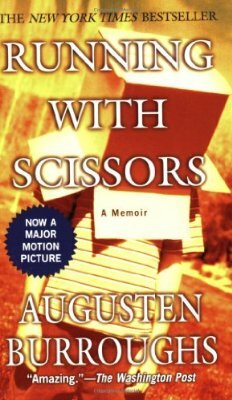 Posted in Authors, books, Reading, Writing and tagged 30-Day Book Challenge, Augusten Burroughs, Running With Scissors. Bookmark the permalink. I have to admit, Augusten Burroughs is pretty cool. It’s been quite a few years since I’ve read his stuff but I remember this story about his calculating housekeeper in ‘Magical Thinking’. Bloody hilarious. Oh yeah, that’s definitely a great one. I love his short in ‘Possible Side Effects’ about getting his new dog- the little cow. It’s awesome. Don’t think I’ve read that. Must revisit his stuff soon. Pingback: Book Challenge Day 17- Favorite Autobiographical Book « What are we…the Whos?